We finally got around to hanging the shelves I've been wanting in my dining room for the last year or so. The boards have been sitting in my garage for months. 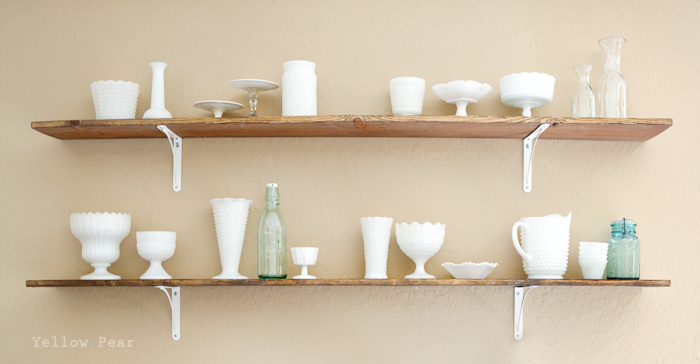 But we buckled down, got them measured and hung and I happily set to work gathering all of my milk glass and setting it out for display. 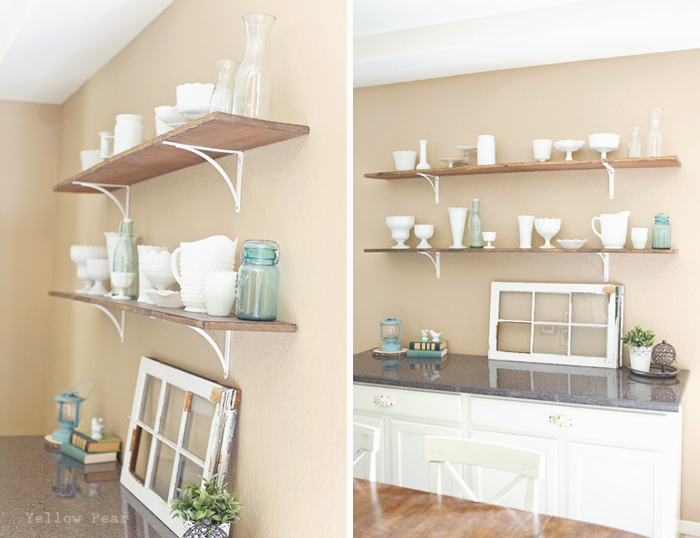 I love how they turned out and I even love that the top shelf was super warped and uneven. It straightened out just enough when we screwed it into the brackets, but also left enough of it's uneven character for me to admire. I wanted some super thick salvaged boards but they don't seem easy to come by around my neck of the woods. I guess if I ever do find some, I can switch them out. So...we just bought simple pine boards from the home improvement store and stained them with Minwax Special Walnut...one of my favorite medium stains. My hubby picked out the white metal brackets and I LOVE them. I had originally bought some simple wood brackets that I intended to paint white but he thought these would be easier to attach. I ended up liking them a ton better because of their sleekness and simplicity...plus I didn't have to paint them! Bonus. I love what the shelving did to the entire feel of the room. It changed it entirely. Now I want to utilize my vertical space in every room. What a difference and what a storage opportunity! Thank you Kenzie. I am glad you like them!